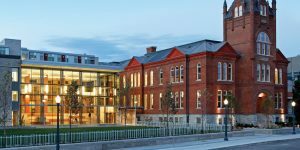 There are two distinct EMBA offerings at the Queen’s University Smith School of Business: a 16-month Executive National MBA, and a 17-month joint Executive MBA Americas in partnership with the Cornell University Samuel Curtis Johnson Graduate School of Management. The 16-month Executive MBA is a hybrid program, with classes offered in numerous Canadian metros and digitally, with classes held on Fridays and on Saturday mornings, every other week. It begins in early August at Queen’s University with the formal schedule launching in September. Students head back to the business school campus the following February for a week-long Creativity and Innovation Session. The final month of the program, November, features a week-long Strategic Electives Session on campus as well. A one-week international study session in optional. The Executive MBA Americas is on a similar schedule, with classes held all day Saturday and on Sunday mornings, every other week, although the program formally begins in June with two separate one-week sessions on the Queen’s University campus, followed by the Cornell University campus in Ithaca, New York. The following February, students participate in a week-long Business Venturing Session in Scottsdale, Arizona. The program concludes like the formal Smith School of Business EMBA, with a week-long Global Business Session in November, 17 months after the program starts. The November session is split between Queen’s and Cornell. The curriculum of both EMBA programs are built around class instructions, real-world projects, case studies, and simulations. As well, both programs feature the same standard for project completion. Students in either EMBA program must complete a team-based Global Business Project and a choice of either the a New Venture Project or a Management Consulting Project. Students in the Smith School of Business National EMBA program are, on average 38-years old and have 15 previous years of work experience and nine years of management experience. Students in the Executive MBA Americas typically are 37-years old, have 13 previous years of work experience and eight years of management experience. The total cost of the Queens Executive MBA is $102,000 CAD for National students. The total cost of the Executive MBA Americas is $139,865. These expenses cover the cost of tuition, books, coaching, meals, and accommodation for any on-campus residential sessions. Each version of the EMBA program requires a nonrefundable $5,000 deposit to hold a spot in the program after admission. All students are considered for merit-based scholarships. Canadian students can help finance their education through the Kingston branch of RBC Royal Bank and the Ontario Student Assistance Program, while international students may fund their education through entities such as Prodigy Ltd., or other federal companies. Strong applicants will interview with the program director either via Skype or in person. There is no application fee, or GMAT/GRE requirement. However, GMAT scores can help strengthen an application.